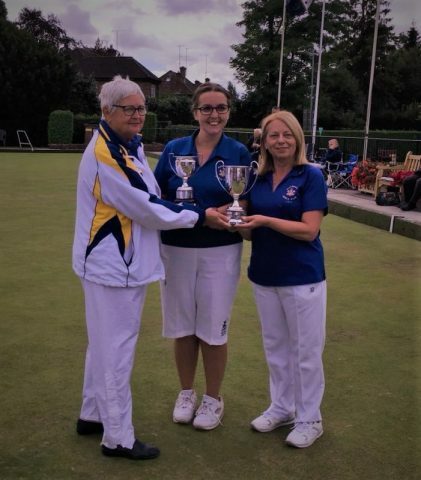 The final of the Ladies County Pairs, delayed from the rain-affected County Finals Day in August was played at Devizes on Saturday morning and saw further success for Highworth’s Joanna Hicks and Linda Young. Playing short jacks, the pair raced to a 16-4 lead, but with their opponents, Sue Cooke and Alex Jacobs from Box, gaining back control of the jack, came to the last three ends leading 21-14. The next two ends saw the Box pair gaining two shots on each and with one end to play cool heads were called for. Jo put up a good wood to put the pressure on their opponents, but the Box skip then ran the jack, added a second close bowl before getting a third into the head to raise the possibility of a further end to decide the winners. However, with two foot of room to play with Linda delivered a bowl that cut the count to two and Jo and Linda could celebrate becoming county champions for 2018. Congratulations to Jo and Linda on what has been a very successful season to date for Highworth’s ladies and with the S&D Finals Day to come next Sunday there are further opportunities for more titles to come this season.